When considering a utility vehicle, there are certain names that automatically come to mind. The Polaris Ranger is one of the leading options on the market today and a fan favorite for obvious reasons. With a focus on traversing the tough terrains without losing traction and stability even when carrying a heavy load, this model is a great go-to that shows the possibilities of the brand. When you need the right solutions for your model, we have you covered with the best in Polaris Ranger parts right here. 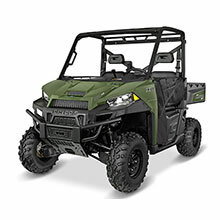 When looking at the path the Ranger took to become one of the leading options on the market, you have to start back at the 1996 six-wheeler Ranger they introduced to rival the popular Kawasaki MULE. While they would eventually streamline it down to four wheels, they never compromised on the inherent power and performance of the Ranger. With a focus on traveling tough terrains with ease while ensuring an impressive engine performance and overall stability, Polaris would soon end up in a government contract with the Army thanks to the dependability of the design and manufacturing. This achievement stands as a testament to the outstanding quality and performance of the Ranger which is why it is still one of the most sought-after options on the market today. We offer one of the largest selections of Polaris Ranger parts on the market covering several decades. With parts covering every possible aspect of this model, it has never been easier to find the right solution. As an authorized dealer of OEM parts for this manufacturer, rest assured that every option is made to fit the exact specifications and performance expectations for the year specified. Whether looking for drivetrains, brakes, seats, air intake system components, or suspension needs, we have you covered with our wide selection of high-quality Polaris Ranger parts. If you have any questions regarding any of these Polaris Ranger parts, please contact us for further assistance. We are happy to assist you in finding the right equipment for your vehicle.